Manufacturer of a wide range of products which include hdpe sprinkler bend and hdpe bend. We have been counted as major firm offering high performing HDPE Sprinkler Bend. We specialize in leveraging the innovative techniques to present most effective designs of sprinkler accessories, and the offered bends exhibit our capabilities to present the most viable solution for water economy. 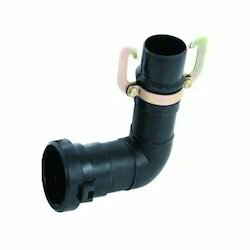 Ideal to be used with all kinds of sprinkler and irrigation systems to direct the water flow, the offered bends are fabricated from injection mould technique and confirm to the highest quality standards. Further, these leak proof and long lasting bends can be ordered from us at a leading price. We have gathered huge recognizance by developing highly demanded HDPE Bend. These bends are the innovatively designed accessory most essential for effective irrigation in all directions. We are utilizing finest grade High Density Poly Ethylene (HDPE) material and injection molding techniques to fabricate the flawless bends for various medium to low pressure sprinklers. Further, our offered bends are strong and long lasting and can be availed from us at a competitive price.